Ooberpad brings you the Bowers & Wilkins (B&W) 707 S2 - a premium-grade 2-way bookshelf speaker from the legendary British audio brand. The compact speaker is designed to deliver realistic sound, powerful bass and superior clarity of vocals and treble effects. Featuring a 2-way vented-box design, the B&W 707 S2 incorporates a 5” Continuum cone FST midbass driver for detailed midrange and a tight bass response with a 1” Decoupled Carbon Dome tweeter or a clear and bright high-frequency response. With minimal and classy design aesthetics, the bookshelf speaker emanates a high-end appeal in your living room or vinyl setup. You can use these high-end bookshelf speakers as a standalone stereo setup or as part of a multichannel home theatre system. Get ready for B&W's legendary studio-quality sound and clarity in your music, movies, TV shows and gaming sessions. 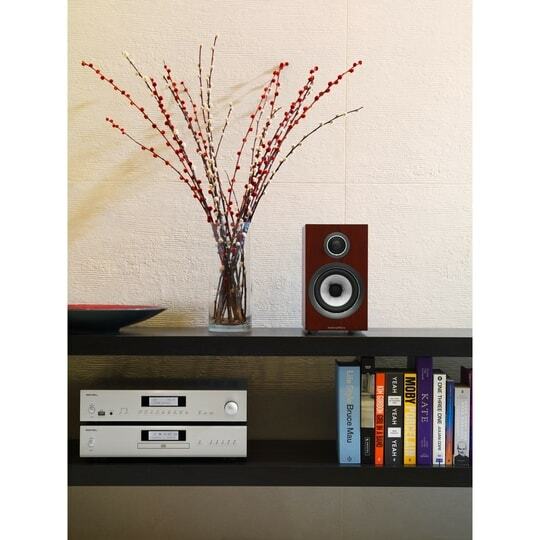 The B&W 700 Series is an entirely new range of speakers that are designed from the ground up. B&W incorporated some advanced technologies from the flagship 800 Series Diamond and infused them with new technologies designed specifically for this range. The result is a series of speakers that deliver pristine studio-quality sound in your home and living spaces. The B&W 707 S2 bookshelf speaker incorporates a 1” Decoupled Carbon Dome tweeter that borrows technology from B&W’s flagship series. The output is a clear high-frequency response with pinpoint imaging accuracy and detail. The 5” mid-bass driver of the B&W 707 S2 bookshelf speaker features a decoupled design, adapted from a similar system in the 800 Series Diamond. Decoupling drastically reduces cabinet colouration and increases mid clarity. Additionally, the Continuum™ cone incorporates woven & coated material that delivers a bright midrange and a tight bass response. Acoustically-matched with the B&W 700 series, the bookshelf speaker can be either used as a standalone stereo system or part of a multi-channel setup for a seamless surround sound experience. Bring home B&W's pristine studio-quality sound and clarity in your music, movies, TV shows and gaming sessions. Buy the Bowers & Wilkins (B&W) 707 S2 bookshelf speaker online at the best price in Mumbai, Delhi, Bangalore, Chennai and all across India. Enjoy expert, prompt and courteous customer service from the Ooberpad team. We will help you choose better and give you all the support you need to take the right buying decision in India.